If you've lived in Chicago long enough, it's a jingle you know well: "588-2300...Empire!" The man behind the jingle was ad copywriter Elmer Lynn Hauldren, who passed away Tuesday at the age of 89. 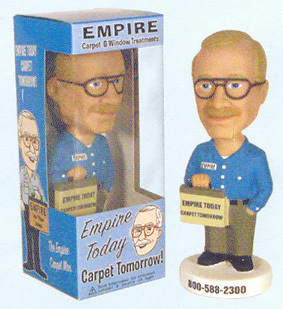 Hauldren, better known as the Empire Carpet Man, was the face behind the carpet company since the 1970's, and worked until his death, the Chicago Sun-Times reports. Hauldren's legacy with the company continues through animations and even bobble head toys. Mr. Hauldren was a decorated World War II veteran who continued to lend his voiceover talent to Empire’s commercials until his passing. In addition, he was known as a key singer in the barbershop quartet arena, recording several albums with the quartet, Chordiac Arrest, and a vocal ensemble called Chicago Natural Gas. "People are good-natured," Hauldren told the Tribune in 1997, "but once in a while they'll grab at you and say, 'Here's that carpet dude!' or 'Hey! Aren't you somebody?' I always hope folks understand I'm not a celebrity. I'm just a TV pitchman, a glorified salesman."